SAO PAULO, Brazil - In a rare comment on FIFA issues by a World Cup sponsor, Adidas said it was concerned about renewed allegations of corruption. "The negative tenor of the public debate around FIFA at the moment is neither good for football nor for FIFA and its partners," the German company said in a statement. The World Cup ball provider spoke out following renewed claims of financial wrongdoing linked to Qatari former FIFA board member Mohamed bin Hammam and his country's successful 2022 World Cup hosting bid. The Sunday Times has published claims in a second week of reports drawn from Bin Hammam's emails and documents, which previously alleged he paid millions of dollars to buy support from African football officials. The newspaper said the former Asian football leader arranged government-level talks for Thailand's FIFA executive Worawi Makudi - his longtime ally on FIFA's executive committee, and a World Cup voter - to discuss a natural gas sale which was "potentially worth tens of millions of dollars to Thailand." Adidas said it is "confident that the matter is being dealt with as a priority" by FIFA's ethics committee, which is investigating the 2018-2022 hosting contests. Russia won the 2018 hosting rights. FIFA ethics prosecutor Michael Garcia has said he will close the information-gathering phase of his investigation on Monday. He should update FIFA's 209 member countries on his work on Wednesday at their annual congress in Sao Paulo. "Adidas enjoys a long-term and successful partnership with FIFA that we are looking forward to continue," the firm said. 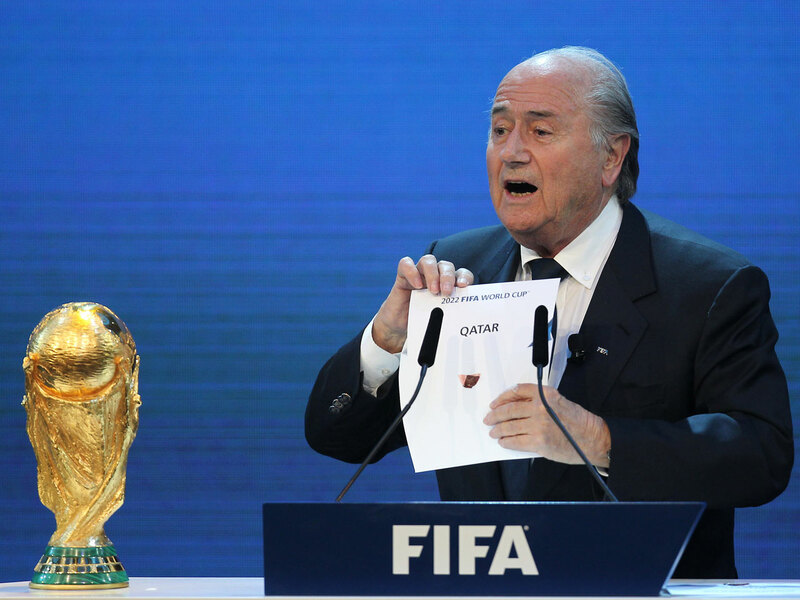 Meanwhile, Qatar said Sunday it is confident it will retain the rights to host the 2022 World Cup. Questions about the integrity of natural-gas rich Qatar's win have swirled since the 2010 vote. Its winning proposal has come under renewed scrutiny in the run-up to this year's World Cup in Brazil after Britain's The Sunday Times last week disclosed what it alleged were $5 million in payments Qatari Mohammed Bin Hammam made to build support for Qatar's bid. Qatar has denied wrongdoing and insisted that Bin Hammam played no official or unofficial role in its bid. The paper on Saturday published new allegations surrounding Bin Hammam, a onetime member of FIFA's executive committee and president of the Asian Football Confederation. He has since been expelled from FIFA for corruption. Among the latest allegations were charges that Bin Hammam arranged government-level talks for Thailand's FIFA executive Worawi Makudi to discuss a natural gas sale that the paper said was "potentially worth tens of millions of dollars to Thailand," and was invited by Vladimir Putin to discuss sports-related relations between Russia and Qatar before their victories in the votes for the 2018 and 2022 World Cups. The newspaper also alleged he made payments of $1.7 million to win support from Asian officials. The Qatar 2022 Supreme Committee for Delivery and Legacy said Sunday that it stands by a statement issued last week denying any impropriety in securing rights to host the tournament. It added that it has fully cooperated with an ongoing investigation into the 2018 and 2022 bid process. "Consistent with FIFA's rules we have been asked to refrain from commentingon the investigation and we will comply with that request," it said. "Qatar has won the bid on its merits and we are confident that at the end of the appropriate process, the award of the 2022 World Cup to Qatar will stand." A FIFA investigation into the winning bids from Russia and Qatar is expected to finish this week. FIFA's ethics investigator, Michael Garcia, a former U.S. Attorney in New York, plans to deliver his findings by July.